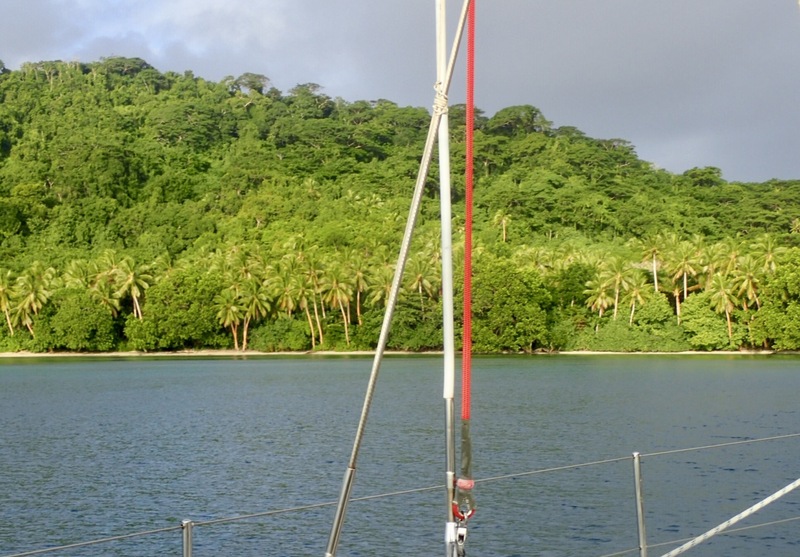 In the North East corner of Fiji lies the small Island of Rabi, Thursday afternoon we anchored on its northern shore in Albert Cove. The population of Rabi are not Fijian but Micronesians, originally from the Island of Banaba, a tiny speck in the Pacific Ocean near the equator and part of the Republic of Kiribati. Banaba came to the notice of the British Pacific Island Company at the end of the 19th century for its rich reserves of phosphate, over the next 40 years they gradually, with very little recompense to the locals, stripped most of the island bare. After further devastation caused by Japanese occupation during the Second World War the British bought Rabi Island with the Islanders Provident Fund set up for to receive phosphate royalties and moved the majority of the population to Fiji. Rabi is a beautiful and fertile land but not the home of these displaced people. We learn their society is run by elders and everybody acts together as a community, sharing childcare and food production. Albert cove has just three or four simple shacks. 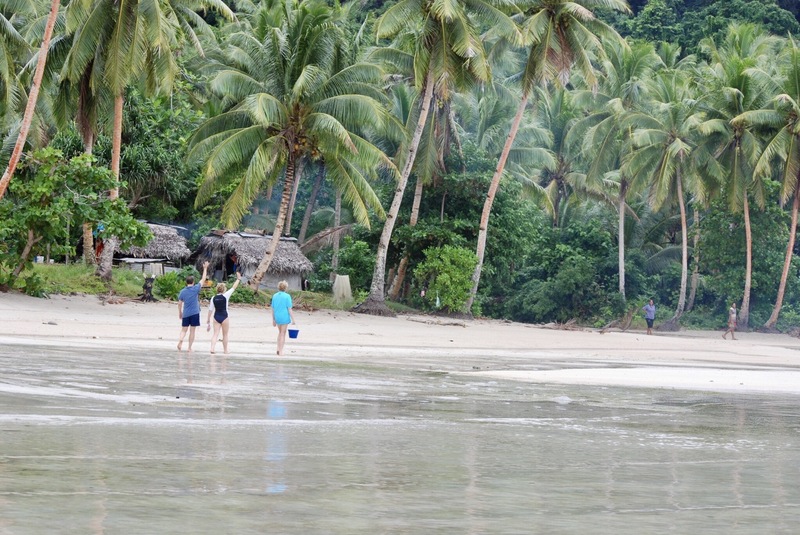 Members of the village on the western shore appeared to rotate their occupancy of the land around this bay to create an income from harvesting copra (dried coconut meat) for the production of coconut oil and growing Kava, a root with slight intoxicating properties, to sell to the Fijians. As we carefully wound our way around the coral reefs into the bay we first spotted Baea fishing the shallows with a large net. 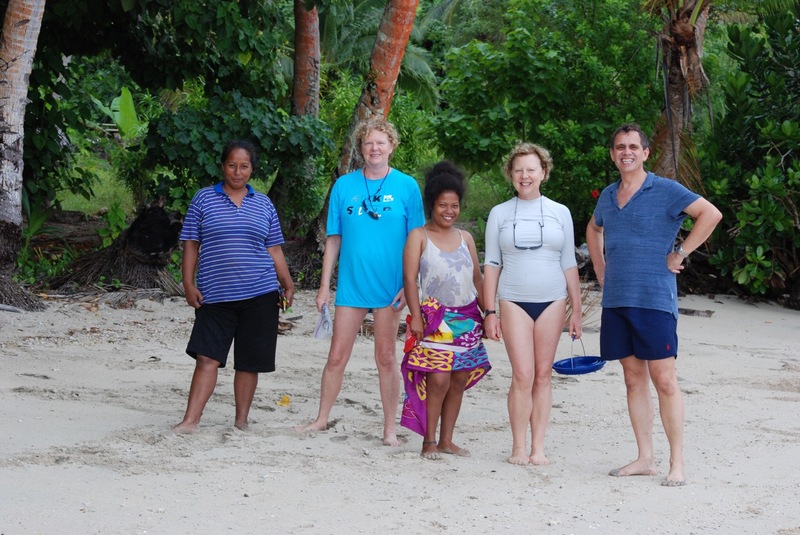 In Fiji the owners of the land also own the beach and the fishing areas around that land, it is therefore appropriate, in the more remote spots, to ask permission to anchor, explore the beach and swim in the sea. Tradition requires the presentation of a gift or to use the Fijian, sevusevu. This is normally a small amount of Kava root that is ground and prepared for a ceremonial drink. We had been told that the people of Rabi not being Fijian did not partake in sevusevu, so we went ashore instead armed with biscuits, Coke and Kitkats. Baea and her family were very friendly and she spoke good English, her husband cut coconuts for us to drink from and we chatted for a while. We, rather abashed, as they explained their history and the arrogant actions of our forefathers, they aghast, when asked how many people lived in ﻿our village, by the the concept of the millions of people living in London and fascinated by Penny’s status as a career woman. Further along the beach was Monique and her friend, cousins of Baer but much younger and after a polite introduction came an embarrassed request to charge her and her friends phone, having collected one from Baer too, we returned to the boat free to roam the bay. Albert Cove is a piece of paradise, a long curve of white sand, edged with palm trees, mangroves and Futu trees, also called the poison fish tree, it’s pretty flowers belie the dangers of the highly poisonous seeds that are contained within large box shaped pods. Beyond the beach area were high jungle covered hills and out to sea a double line of reefs lay under the bright blue water. The reefs not only made for good snorkelling but meant the bay was well protected from the ocean swell. The next day we returned to the beach with the phones, it was a bit of a mystery as to their use, as the bay had not even a sniff of a signal. More immediately useful for us, and them, was the large bucket of food waste we bought ashore for the very grateful family pigs. ﻿Baea had told us that an English man who had married a local girl had built a small house on the far end of the beach, now very old he had not visited for a while but the house was still perched on the rocks behind the trees. At high tide, so we could get over the encircling coral we landed the dingy on the beach. 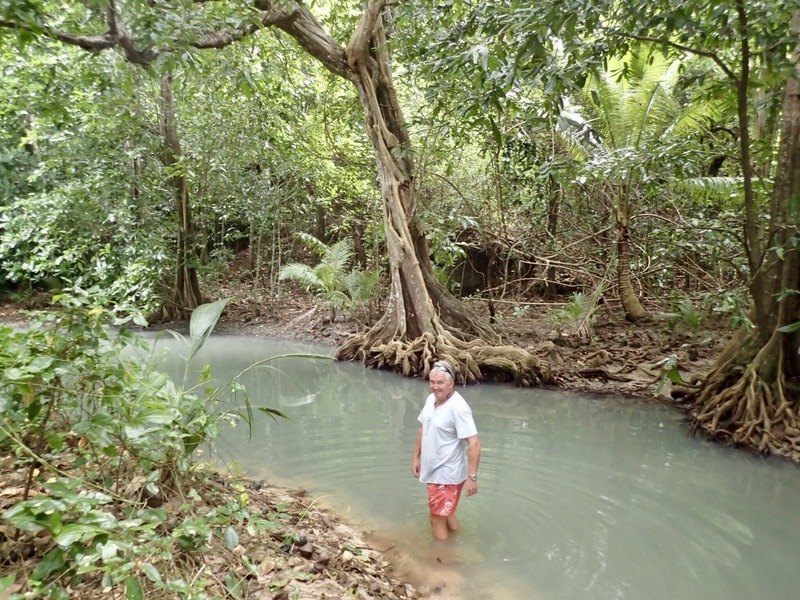 With our adventurers hats on, we scrambled through the trees to discover a fresh water pool, magnificent Banyan trees and high up a cliff, nearly engulfed by the undergrowth, a small blue hut. Just yards from the beach the atmosphere of the shady clearing felt very different, cooler, the colours muted compared to the brightness outside and slightly spooky, we didn’t linger too long and never discovered how anyone could have actually reached the hut. Incredible roots of the Banyan trees. Saturday morning as we slowly prepared to up anchor﻿ a longboat came around the corner to pick up Baer, her husband and friend and return them to the village. Their two small very pink pigs were scooped up and dumped squealing into the boat and they motored out of the bay. About an hour later a group of three young men armed only with a large bag of bananas came to take their place. As news of more terrorist atrocities and the political chaos caused by yet another controversial U.K. election filtered its way to us through our satellite connection it was humbling to watch theses happy, generous people, living such peaceful and simple lives. 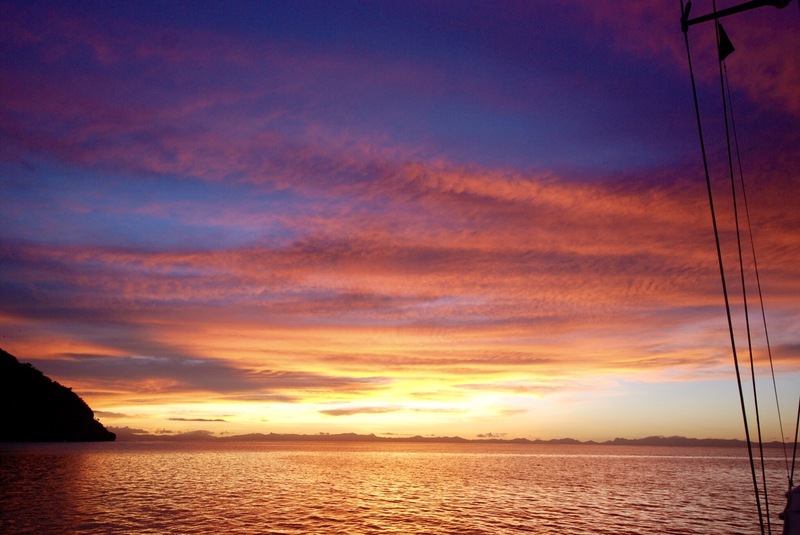 This entry was posted in Fiji by Roz. Bookmark the permalink.